This is definitely a coffee table book as the size (not small) would indicate. Although the author listing might indicate it was put together by a committee, the info offered is very good. Photos of a full size four seater C2 are offered, proving we are all fortunate that the idea never made it to the showroom. Reasonably priced. Nice, but brief overview of Corvette progress ending with the 1996 Grand Sport model. Very good photography accompanies the technical explanations. 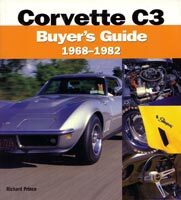 Knowledgeable and in-depth, the "Corvette C3 Buyer's Guide 1968-1982" is a must read for anyone considering the purchase of a C3 Corvette. Each year is covered in detail, with common problem areas and parts cost well covered. Don't go C3 shopping without it! Corvette C6 coverage is excellent with superb photography and development details. The production line is also visited, including a comparison with the Cadillac XLR which shares the Bowling Green assembly plant. Styling sketches and photos of preliminary designs give 'vette fans a glimpse of what almost was. Concentrates on the C4 Corvette. Written by Mike Antonick, the author of the famed "Corvette Black Book". It has the same feel and contains the same info, with an emphasis on technical changes. Extensive specifications sheets are offered along with excellent technical explanations. Very thorough and necessary reading for owners or potential owners of C4 Corvettes. All photos are black and white, so this is not a coffee table book. 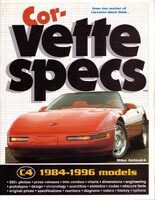 Hopefully Mike will publish editions on the other 'Vette generations. 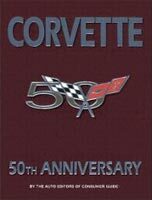 Available in hard cover and paperback, "Corvette Fifty Years" has some of the best 'vette photography you will find anywhere. The race cars are given excellent coverage and here the photos (with David Newhardt) really stand out. The text unfortunately can be uneven when compared to the images. 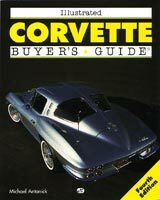 Overview of 1953 - 1997 Corvettes with good practical data for anyone interested in purchasing a classic or near classic Corvette. Details regarding options are available along with practical advice re: living with a given model. Investment grade rating system is offered. The only criticism is that since the last printing was 1997, some of the information is out of date. Noland Adams is one of the most respected Corvette authorities and is known for his thorough expertise in solid axle Corvettes. 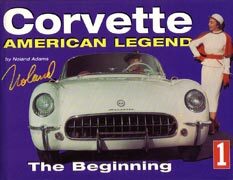 "The Beginning" portion of the title is taken seriously as there is excellent coverage of the influences that preceded the 1953 Corvette. The story is told mainly via photographs which include extensive coverage of the fiberglass process. A fascinating look at the earliest years. A Corvette classic, the "Black Book" is highly regarded by Corvette aficionados. Information included: production numbers, option descriptions and quantities, VIN and serial number sequences for major components along with a brief rundown of significant developments. An excellent research tool that is updated regularly. 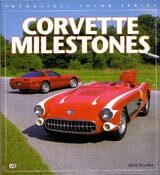 The Corvette Illustrated Encyclopedia is 314 pages of definitions, all high quality and well written. Corvette personalities are nicely covered amongst the 700+ listings. 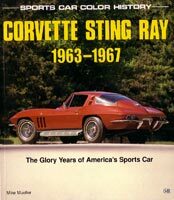 Although Corvette is the focus, the same book would serve well as a general automotive reference. 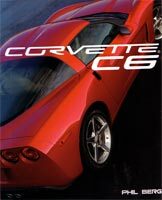 An in depth look at how the C5 Corvette was developed. Author James Schefter was given unprecedented access to the process and was there at each agonizing and difficult step of the way. After reading "All Corvettes Are Red" C5 owners will look at their cars with newfound respect. 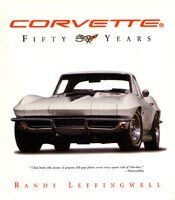 An important book not only for Corvette fans but students of modern industry.